Nowsad, AKM, A. 2013. (Ed). Post harvest Fisheries Management Aimed at Reducing Post-Harvest Loss and Maximizing Proft. Proc. Intl. Symp. 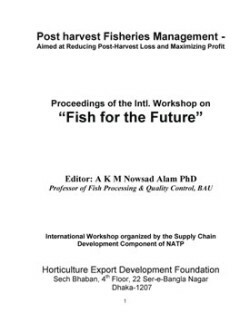 Fish for the Future, of the Supply Chain Development Component of NATP. Horticulture Export Development Foundation, Dhaka. 101 pp. Visited 94 times, 1 visits today | Have any fisheries relevant question?